Hendricks Bus Company is a locally-owned transportation company providing bus services to Kimball students. Working alongside Kimball Schools, Hendricks seeks to provide safe transportation to school, after-school activities, field trips, summer programs, and more. Who do I contact if my child will not be riding the bus for a day? Call Hendricks Bus Company at 398-2691. If necessary, leave a message. How do I notify the bus company if my child need pick-up or drop-off at a stop not normally on the schedule? The bus company will accommodate changes in the route schedule if the request is made on the Ride Accommodations Form with an advanced notice. Is there bus pick-up for students living outside district boundaries? Pick-up spots include Luxemburg (feed mill), St. Augusta (Catholic Church), downtown Kingston, and Watkins (Catholic Church). Further options may be considered on a case-by-case basis. How will I know what bus my child rides? After schedules are created, students enrolled at Kimball Schools will receive transportation information in the Back-to School information provided by the school. How are discipline problems on the bus addressed? 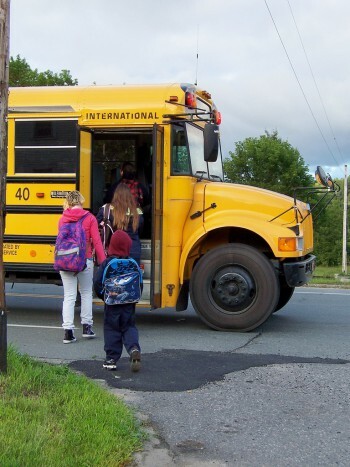 Because the bus ride is considered an extension of the school day, when necessary the discipline issues will be forwarded to the school principal. Consequences for behavior will be given according to the student handbook. My child is going to a friends house for a sleepover. Can my student ride the friends' bus? It is acceptable for a regular bus rider to have no more than one guest accompany them on the bus route. If additional guests will be needing transportation, a parent must call the bus company to ensure there is room on the bus. How can I notify the bus company about drop-off at a child care site instead of the family home? Transportation services to and from a child care site will be accommodated with completion of the Transportation to Child Care Site form. Extra equipment (skis, skateboards, etc.) and large school projects are not allowed on the bus. Other arrangements must be made to transport large items to school. When dropping off a child at Kimball Elementary, please use the east door to avoid interfering with bus lanes. See illustration here.